A guitar being toted around without a guitar case–completely naked and open to the elements. The owner is usually gripping it by the neck or has it tucked under their arm like a school book. The guitar is just one wrong-turn away from banging into a wall or some other immovable object. Do You Really Need a Guitar Case? I’m willing to bet that you do, but there are a few (rare) instances where someone might actually not need a guitar case. 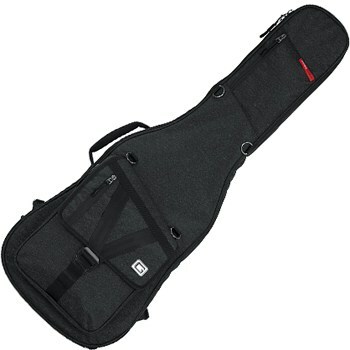 You may think the sole purpose of a guitar case is to protect your guitar from damage or weather. Sure, protection is one function, but their other purpose is to make your life easier. Guitars can be awkward to carry around, so even a cheap gig bag will make transporting easier–allowing you to strap the guitar onto your back and tote it across town on your bike, if you’re so inclined. Now, if you have a very cheap guitar and seriously don’t plan to ever take it anywhere–not even to the music store for occasional maintenance–then maybe, just maybe you don’t need a guitar case. 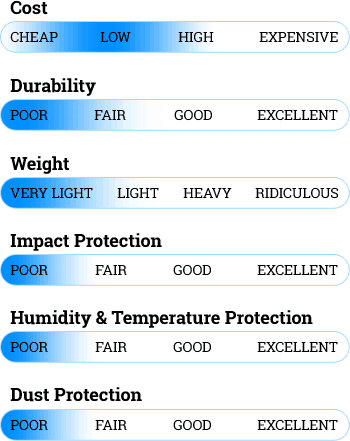 Of course, there’s a lot of variety under each of these 3 broad categories, with lots of variation in price, weight, durability, and how well each will protect your guitar. Really, what kind of guitar case you need comes down to what you plan to do with the guitar. Are you just carrying it around inside your house, or are you regularly throwing it into a packed trailer and hauling it to live gigs? Depending on how active you are as a musician, you may actually want more than one type of case. Now, let’s dig deeper on each of these major categories, break them down further, and discuss some of the pros and cons of each type of guitar case. Gig bags have an exterior that’s usually made of nylon, polyester, leather, or some combination of those materials. In addition to standard carrying handles, they usually include at least 1 additional shoulder strap. Many even have backpack-style straps so you can comfortably wear the gig bag on your back, freeing-up your hands to do other things like riding a bicycle. 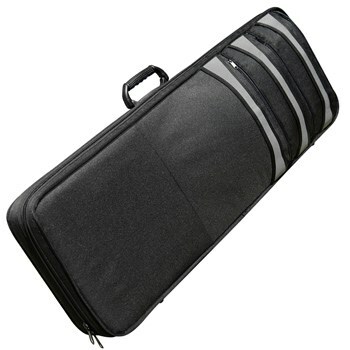 Most gig bags include at least one large outer accessory pocket for sheet music, cables, straps, etc. Some high-end gig bags also include rubberized reinforcements on outer surfaces. There was a time when gig bags were thought of only as cheap, minimal protection–suitable for low-priced guitars that weren’t going to be subjected to rigorous travel/transport. 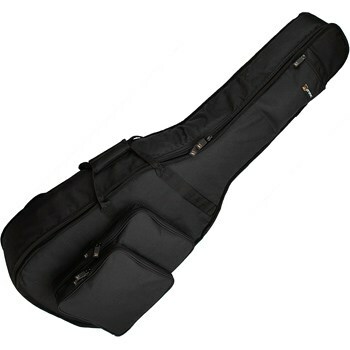 You bought a gig bag to make carrying the guitar easier, not to protect it. 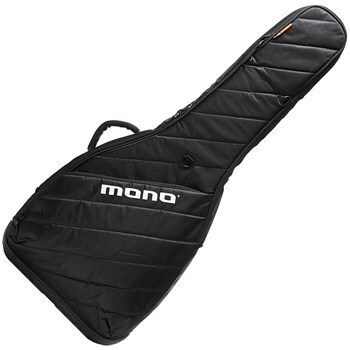 However, gig bags have come a long way and while light-duty, low-cost gig bags are still available, nowadays manufacturers such as Mono, Fusion, and GruvGear offer high-end gig bags that provide really good impact protection. Gig bags can range in price from less than $10 to over $300, with most decent-quality gig bags falling in the $75 – $150 range. The beefier gig bags (what I like to refer to in this article as ‘high-end’) offer decent protection when transporting the guitar around town. 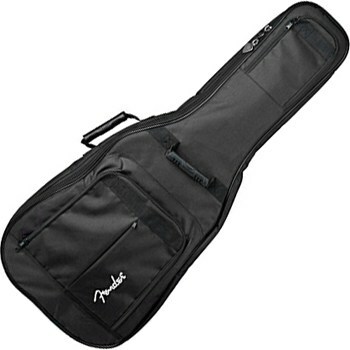 Gig bags can be suitable for taking your guitar to/from gigs but only if you plan to hand-carry or generally keep the guitar with you most of the time. Gig bags are NOT suitable if you need to pack your guitar into an equipment trailer, or otherwise expect it to be knocked around a lot. Never use a gig bag where there’s a chance it can fall, or if there’s any chance something might fall on, bump into, or be stacked on top of it. I’ve seen others recommend using a gig bag if you plan to fly with your guitar–citing that air crew will be sympathetic to a soft case and therefore allow you to take the guitar on the plane. Yeah, maybe, but in my opinion this is a huge risk. You have zero guarantees that air crew will be feeling generous or that there will be room on the plane. Therefore, I do not recommend using a gig bag for air travel. 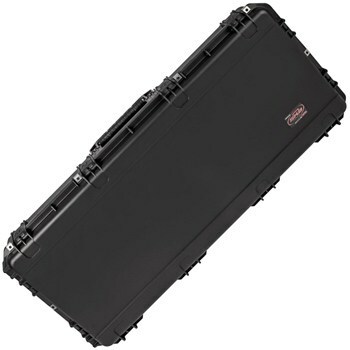 Buy a molded ATA flight case with TSA latches (discussed later in this article) instead. Large storage pockets for big items like music books, sheet music, etc. Hard cases have an outer shell that can be made from some combination of hard materials such as wood, plastic, fiberglass, metal, or even expensive specialty materials like carbon fiber. Inside, they’re soft, padded, and lined with a plush material that’ll protect the guitar from hard impacts and won’t scratch the finish. They often include one or more compartments inside for smaller accessories. Hard cases always have 1 main handle for carrying and some also include an optional shoulder strap. Some even have luggage-style wheels built in. Chipboard cases are flimsy and use low-quality hardware. Never put a guitar you actually care about in one of these. 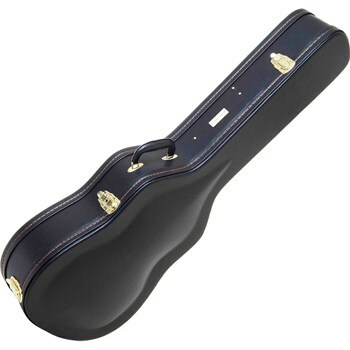 This pathetic excuse for a guitar case barely deserves to be in the “hard case” category. Made from chipboard–a thick cardboard-like material–they’re somewhere between a soft and hard case. They have extremely cheap latches and hardware that is prone to failure. 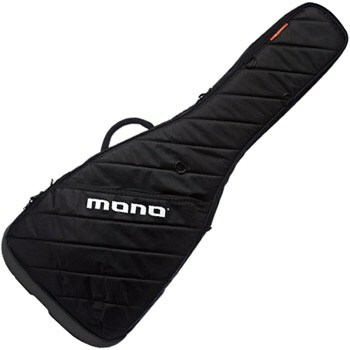 They lack any kind of padding or plush material inside to protect the guitar or hold it securely. Chipboard cases are really only available for acoustic guitars. When shopping for a guitar case online, you won’t always see “chipboard” mentioned in the product title, so be very careful when ordering a case for your acoustic. If you come across what looks like a sturdy acoustic guitar case, but only costs about $50, it might be one of these chipboard pieces-of-crap (but not always). A dead giveaway is that online sellers will usually only advertise a chipboard case with the lid closed. They won’t show the inside because the lack of a soft, plush interior would turn off most buyers… and rightly so. Nothing, in my opinion. As you might’ve guessed, chipboard guitar cases offer very little protection, and some can be downright dangerous because the interior isn’t padded. Worse, the latches, hinges, or carrying handle can fail or come loose–usually when you least expect it. I advise just staying away from these cases, because there are better options available for about the same price. Just to be clear: I do not recommend buying a chipboard guitar case. You can find better, more protective cases for the same price or cheaper, as you’ll see in the next sections. This is the old standby–the iconic guitar case that, for many years, was the only style hard case that came standard with new guitars. They’re still common, but we’re seeing more and more guitar manufacturers shift away from these wooden cases and using other materials instead. 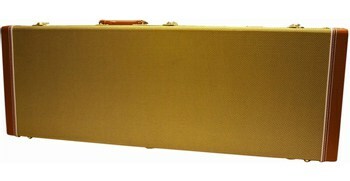 Hardshell guitar cases are usually made of ¼” or ⅜” plywood and covered primarily in tweed or tolex (the same stuff most guitar amps are covered with). 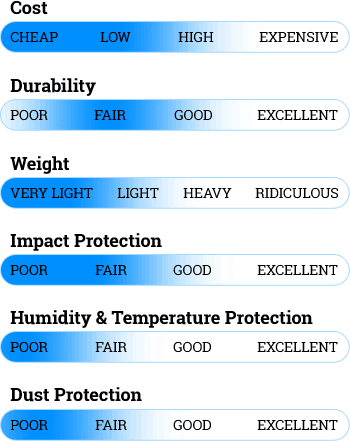 The factory OEM hard cases that come with a guitar sometimes have molded interiors that fit the guitar exactly, which can offer excellent (but not guaranteed) protection against serious impacts. Wooden hardshell cases offer excellent all-around protection for everyday ground transport, such as carrying the guitar around town, taking it on road trips, etc. They can withstand some pretty hard knocks, however, they’re not indestructible. So, don’t be careless and if you travel a lot be sure to inspect your hardshell case for any signs of serious structural or hardware (latches, hinges, and handle) damage. I don’t recommend using hardshell cases for air travel. You won’t be able to carry it on the plane, which means you’ll have to either gate-check or baggage-check the guitar as luggage. The main problem is that the hardware isn’t suited to the abuses of baggage conveyors and careless baggage handlers, nor do these cases include a TSA recognized lock. Now, I did travel with a wooden hardshell case once–years ago before I knew any better. I got lucky–my case arrived with a few gouges and a bit of torn tolex, but my guitar was undamaged. However, baggage-checking a wooden hardshell case is a huge risk that I don’t recommend you take with a valuable guitar. 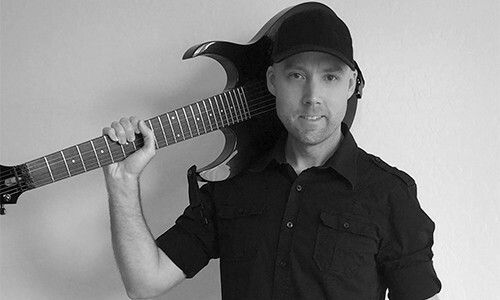 Many guitar companies are now using molded plastics such as ABS (acrylonitrile butadiene styrene) or PE (polyethylene) for their “factory OEM” cases instead of plywood. This type of case has really gained popularity in the past 20 years or so, and for good reason. These plastics are durable and rigid, yet have enough flex to make them highly impact resistant. At the ultra high-end, we see companies like Hoffee, Karura, and Calton using materials like fiberglass or carbon fiber and offering extra options such as Thinsulate barriers for thermal insulation. 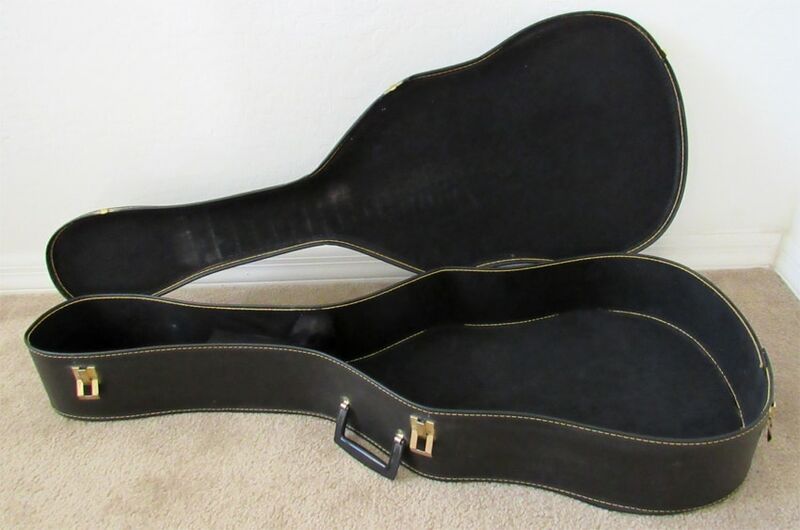 Some molded guitar cases are also airtight and watertight, providing excellent protection from weather, dust, and an accidental dump in the ocean. Molded ATA flight cases include TSA locks, and some even include wheels to make it easier to schlep through the airport. 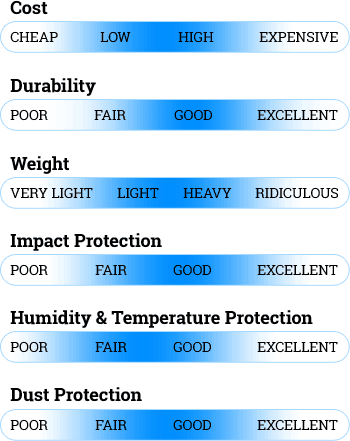 This category of case is very versatile, depending on what type of molded case you ultimately get. 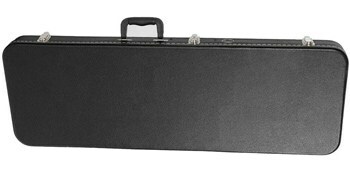 Lower-cost ABS plastic cases provide excellent protection for everyday transportation of your guitar around town, on road trips, etc. They can withstand some decent impacts, but they’re not immune to damage, and tend to use average-quality hardware (similar to wooden cases). Essentially, the same disclaimers apply here as with wooden hardshell cases: don’t be careless, and inspect the case and hardware regularly for damage. A common misconception is that all molded guitar cases are “flight cases” (a case built specifically for the rigors of air travel). They’re not. Don’t assume a guitar case is a flight case just because it’s made out of plastic. True flight cases have a few design upgrades that help them withstand the unique hazards of being thrown around like luggage or other cargo. 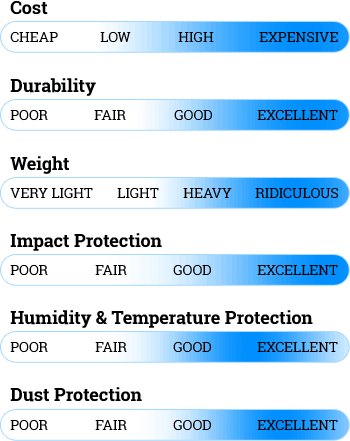 If you purchase one of the higher-priced flight cases, or an ultra high-end (or custom) flight case made from fiberglass or carbon fiber, you’re getting a suit of armor for your guitar that can rival the protection offered by heavy-duty road cases (discussed below). As long as it’s labeled with terms such as “ATA”, “flight case”, etc. and includes TSA latches, you can actually check your guitar as baggage on flights and be fairly confident it’ll survive the trip. 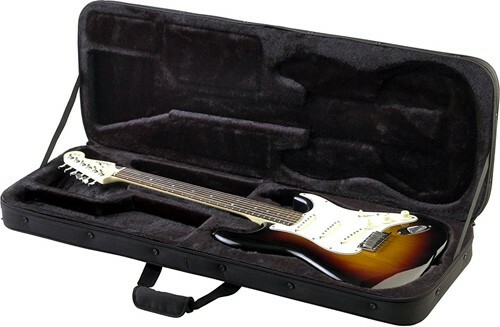 Of course, when it comes to air travel there are never any guarantees, but your guitar will have a fighting chance in a high-quality molded ATA flight case. 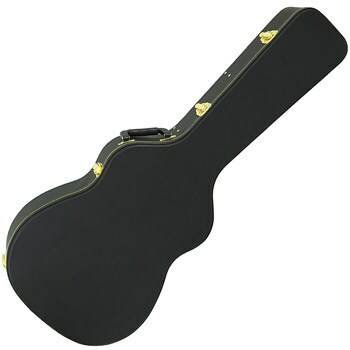 Here are my recommendations for molded cases, for both electric and acoustic guitars. 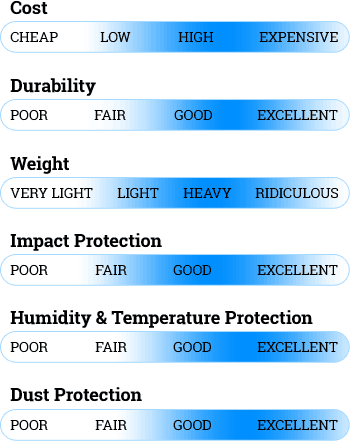 Each quality-level gets progressively heavier with “budget” being the lightest and “high-end” the heaviest. Usual disclaimer: do your own research to ensure you get the right size. I can’t guarantee any of these will fit your guitar. These are the ones the pros use to keep their gear safe when touring. They trust these cases to keep their guitars (and other stage equipment) safe during transport by air, bus, or truck (or all 3). Go see any touring band and you’ll invariably see road cases somewhere at the gig–sometimes on stage. Like wooden hardshell cases, road cases have walls that are made of 1/4″ or 3/8″ plywood. However, road cases take protection to the next level by sandwiching the plywood between layers of thick, tough PVC, HDPE, or similar material (varies by manufacturer). This bolsters the plywood’s natural strength and reduces the chance of it splintering or breaking. All edges are protected with aluminum plating fastened with heavy rivets. This aluminum edging also contributes to the case’s rigidity and strength. Corners are reinforced with thick steel end-caps and all latches and hinges are made of some variety of thick, heavy-duty metal. 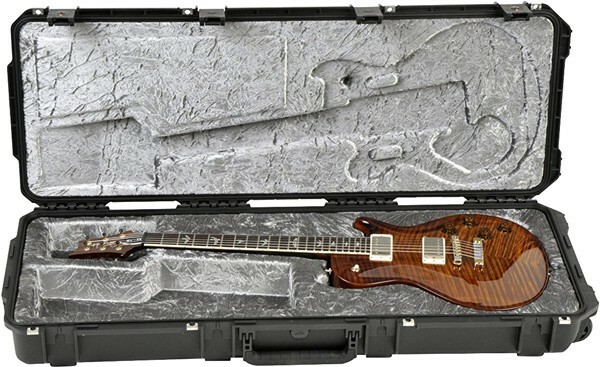 It’s worth pointing out that some molded plastic cases are also considered road cases, but for this category I’m limiting my discussion specifically to the wood-and-metal variety, like the road case you see pictured above (that one’s an Anvil guitar case). Road cases are expensive and heavy as hell, so they’re best suited to professional touring musicians who have road crew. Road crew–affectionately known as “roadies”–are people who’s job it is to load and carry this stuff around for the artists. Though some manufacturers are taking steps to try and make road cases lighter, they’re still extremely heavy. The average weight of a high-quality guitar road case while empty is about 25-35 pounds. 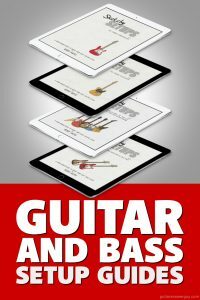 Add the weight of your guitar to that equation and you can see how back-breaking it would be to try and carry one of these yourself. 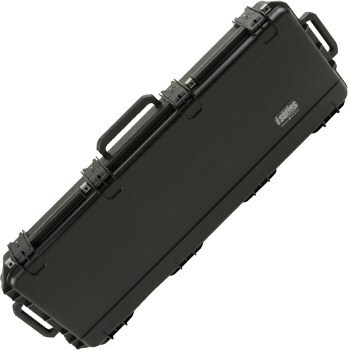 Also, good-quality guitar road cases can be very expensive, usually in excess of $400 for a case. The reason I keep using the term “high-quality” is because, of course, there are also low-cost road cases available. They’re usually lighter, but the tradeoff is that they don’t provide the same level of protection as their more expensive counterparts. Though I’ve never confirmed this myself (and don’t recommend you try it), I’ve been told that you could throw a road case (with your guitar inside) from a 2-story height onto concrete. Your guitar would be undamaged, the case would probably need some minor repairs, and the concrete would probably be toast. Of course, there are a lot of variables in that scenario, but you get the picture. Just search YouTube for “road case strength test” and you’ll find a few such videos. If you’ve got a tour coming up and have a roadie to carry your stuff, here are my recommendations for electric and acoustic guitar road cases. Remember: measure your guitar to ensure you get the right size. I can’t guarantee these will fit your axe. 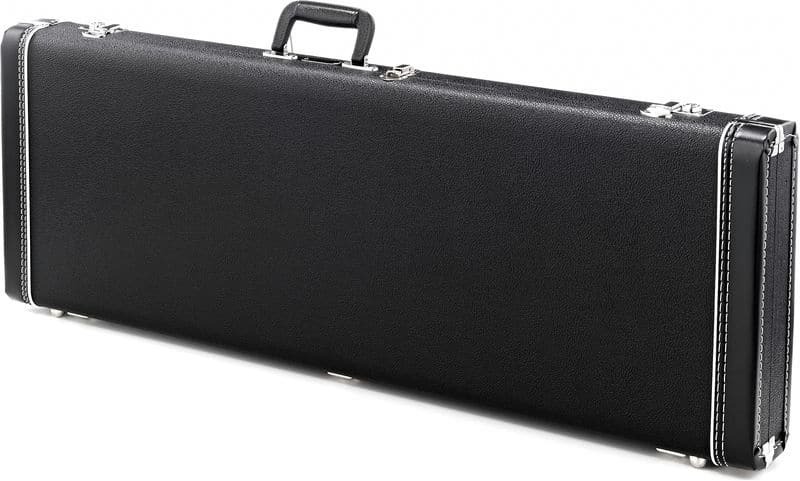 Is it a gig bag, or a hard case? Well, it’s a little of both. If a gig bag and a hard case got together and made a baby, the result would be a hybrid case–the last major category we’ll cover here. 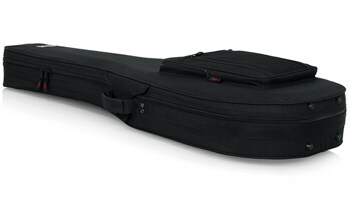 Hybrid guitar cases essentially have the soft exterior features of a gig bag, but have the rigid-foam shape and plush, padded interior of a hard case. 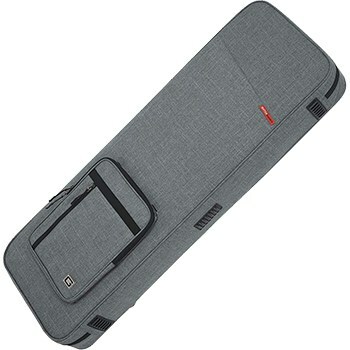 Like gig bags, hybrid cases open and close with a heavy-duty zipper. Other similarities to gig bags include a soft handle, shoulder strap, backpack-style straps, and a large pocket on the outside. Like hard cases, they’ll have a plush-lined rigid foam interior, interior accessory compartment(s), and sometimes have a hard carrying handle. Hybrid cases are great for people who need the light weight of a gig bag, but want just slightly more protection against impacts than most gig bags provide. However, hybrid cases still offer less protection than a wooden or molded hardshell case. This means they’re appropriate for general transport around town and to/from gigs, but only if you plan to hand-carry or otherwise have the guitar with you most of the time. Don’t use a hybrid case if you plan to put it in situations where it could fall over, or where other things might fall or get stacked on top of the case. When it comes to flying, the same rule applies here as with gig bags: just don’t do it. 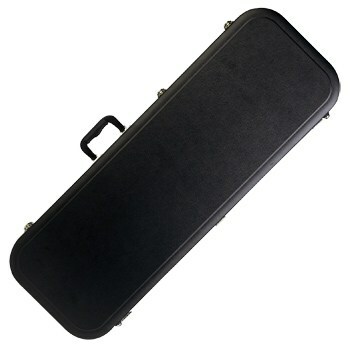 If you plan to fly with your guitar, don’t use a hybrid case, use a molded ATA flight case instead. 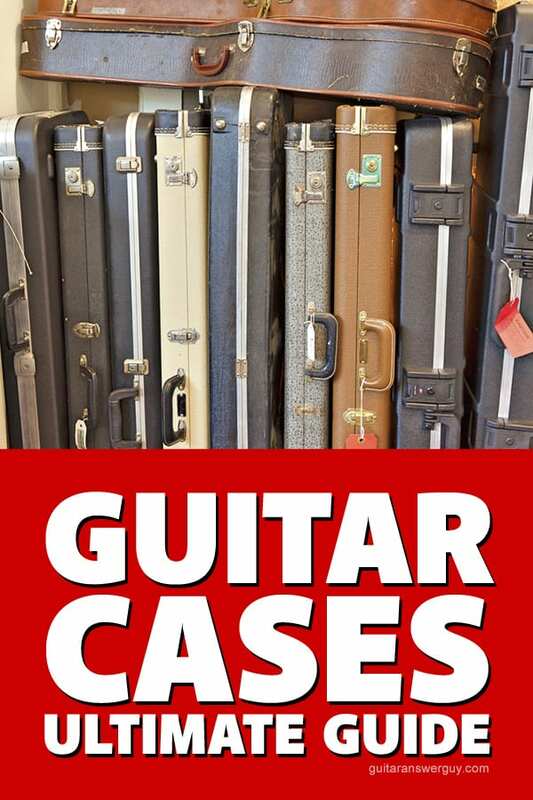 We just covered why you may (or may not) need a guitar case, then outlined the 3 major types of guitar cases: soft cases (gig bags), hard cases, and hybrid cases. We broke hard cases out into the sub-types: chipboard, wooden hardshell, molded, and road cases. Within each of those, I gave you a few recommendations, should you be interested in buying one for your guitar. Oh sure, there are more flavors of guitar cases out there–specially shaped cases, custom-painted cases, cases made from exotic materials or decorated with rare jewels. 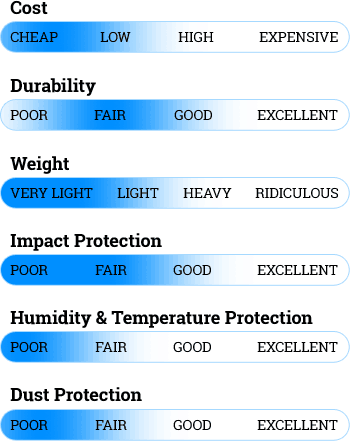 Regardless of how unique a guitar case is, 99% of the time it falls under one of the categories we’ve discussed here. Choose wisely, and know that it’s completely normal to own more than one type of case for different travel situations. What kind of case is right for you? Why? Ever had a case save your guitar from disaster? Ever had a case totally fail on you? Let me know in the comments down below! 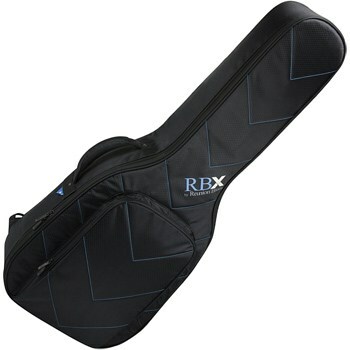 Actually i bought new electric guitar and i bought a hybrid polyfoam case also. I have fight to go back my country this week .sir Can u plz suggest me what i need to do to protact my guitar in flight . 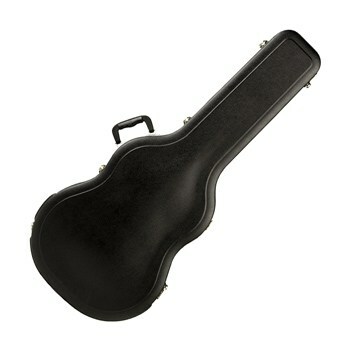 Can that polyfoam case protact my guitar? Hi Tarun. 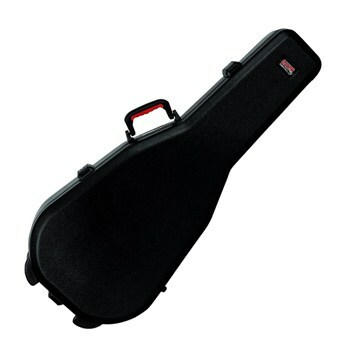 As long as you can keep the guitar in the cabin with you, a polyfoam case is fine for traveling. Where polyfoam cases fall short if is you have to check the guitar at baggage claim. There’s also risk if you have to gate-check it. Ideally, you want it inside the cabin with you. Hi Chris. That model is technically a “jumbo” style acoustic, so I would use that keyword when searching for a case (ex: jumbo acoustic guitar case). Unfortunately, I can’t make a solid recommendation without measuring your guitar first and I’m not sure whether you’re looking for a gig bag, flight case, or traditional wooden case. You’re in the best position to find a case since you have the guitar in your hands, so just measure carefully, and if the case you order doesn’t fit just send ‘er back and try another. It’s not uncommon to have to return at least one case because it wasn’t quite right, but I’m betting that just about any “jumbo” case might work for you. These are not “semi-soft” cases – I think you need to check this Tric link I sent you (Seagull guitars). There’s nothing like this on the market that I’ve seen. I would venture to say you could try putting a knife through the side of this thing and it wouldn’t reach the guitar. They’re rigid foam. Just by luck I buy 2 of these cases in 2009 I think it was and they’ve been my go to travel cases for years. Have carried my Heritage acoustic, a Collings, etc. Never any damage. They are a tad bulky but way better than any straight ABS case you’re going to buy and then put an external strap system onto. I’ll be honest I’m not changing anything I’m doing. I just wanted to share this with your readers as a great option. For a hundred bucks Canadian I don’t see that you’ll offer anyone a better solution. Thanks. 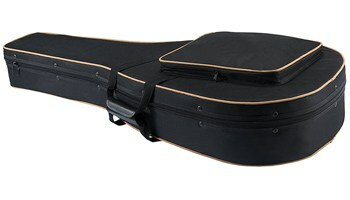 I’ve seen those on Amazon: Godin Acoustic Guitar Case. While I’ve never seen one in-person, I generally wouldn’t be brave enough to use a gig bag or even a hybrid polyfoam case to gate-check a guitar. If you decide to get that Godin TRIC case, let me know what you think of it and how it does on the trip. Hi there. I’ve been doing air travel for years with some fairly high end acoustics. The case I’ve been using for many years is a molded interior with injected foam. I’ve never had a problem with any of my guitars getting damaged but typically I don’t put the guitar and case in general luggage. Most airlines will let you do a gate check so the guitar goes in with the strollers, wheel chairs, etc. Only reason I’ve gone looking for a new case at this point is the zipper has given out on my old one and honestly the carry straps on the back are lousy. I’m not seeing the new gig bag style (like Gator, Mono, etc. really being padded enough to protect any of my guitars. This trip I’m going to Peru so this thing will get hauled through the high Andes and down into the Amazon. Not going to take a chance with damage with these souped up gig bags. But to me without even looking I’m think flight cases are going to be way too heavy and don’t let me keep my hands free to do other things. But thanks for this article – it’s very informative and given me food for thought. Hi Dave. Let me present an alternate possibility, because the thought of giving a semi-soft hybrid case up at the gate makes me nervous. You could buy a decent ABS plastic case, and then use a Guitar Case Backpack System (Amazon link) to strap that sucker to your back and keep your hands free. Please let me know if you would ever like first hand information on ATA case construction, materials or the ATA 300 Cat 1 specification. I would be happy to offer you a tour of our factory. Hi Muffie! I would absolutely love to come tour the factory, however, logistically it’s not possible for me right now. Sadly, it’s for the same reasons I can’t make it to NAMM in January 2019. BUT, let’s definitely keep in touch. It’s a visit I’d definitely like to arrange sometime in the near future. 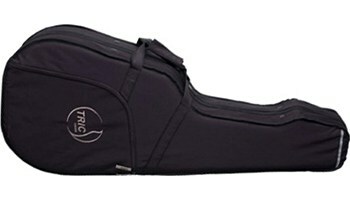 The TRIC cases that Seagull (Godin) Guitars use are excellent hybrid cases, although they are quite bulky. The deluxe TRIC case has a canvas outer cover, backpack straps, and plush interior. They offer rigid protection against bumps and also provide resistance to temperature extremes (TRIC stands for “Thermally Regulated Instrument Case”). I just purchased a WolfPak polyfoam case for my Gibson J45, I am hoping that it will be comparable to the TRIC cases I have for my Seagulls. Thanks for the heads-up on those TRIC cases Brent. For anyone reading this who’d like to check them out, here’s a link to view TRIC cases on Amazon. I took a Yamaha flat top acoustic to East Africa while on a college study tour in 1975. It was in a chipboard case with 1/2 inch foam padding stuffed inside and the outside tied shut with a rope. It looked like it was a cheap attempt at protecting the guitar and apparently it was handled with care by the baggage people. It survived the trip to Africa and back to the USA via England. In 1980 I flew with another flat top in a conventional hard shell case on a 600 mile trip and the lower bout was damaged by a hard bump. Maybe a pathetic attempt at safe guarding a guitar in a chipboard case is better than a conventional case!